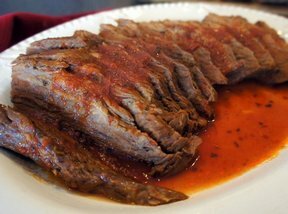 This brisket is so tender and juicy. The tomato sauce it cooks in is delicious and full of flavor from the thyme and rosemary. Be sure to serve the sauce on the side of the brisket. Perfect with cooked cabbage. You could substitute more beef broth for the red wine, if desired. 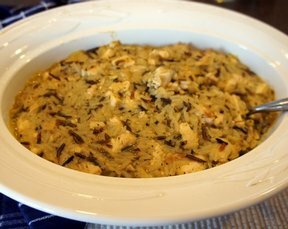 This simple 3 ingredient casserole is delicious and perfect for those busy weeknights. 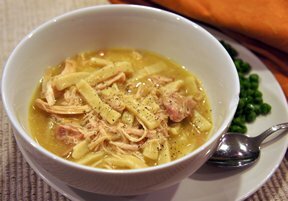 Leftover chicken or even turkey is perfect for this recipe. 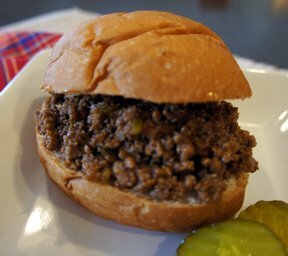 Add mushrooms or celery for a little something extra. 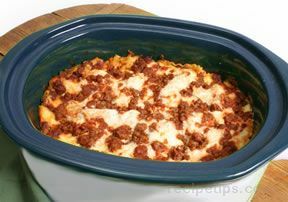 Lasagna done perfectly in the slow cooker. The onion and garlic along with all the seasonings flavor everything and it's all topped off with cheesy layers. 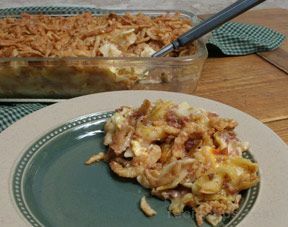 Leftover corned beef becomes a real treat in this easy-to-make casserole recipe that features a creamy cheese sauce and crunchy French fried onions. Only five ingredients are required to make this economical oven-baked hotdish. 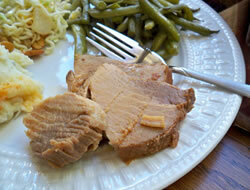 Simple to prepare pork roast, cooked in the oven or in a slow cooker.